Following a visit to an older people’s coffee morning held in the Caddonfoot Hotel near Galashiels in the Scottish Borders it was agreed that Outside the Box (Rural Wisdom partner) would hold a ‘taster’ event for people to try a number of activities identified in the course of a discussion. At the event, a number of taster sessions were available so people could try their hand at different activities, these included New Age Kurling, Bowls & Art and Crafts. The kurling turned out to be by far the most popular session! As a result, during the afternoon tea which followed, participants agreed that they would like to have a regular kurling group in the hall. 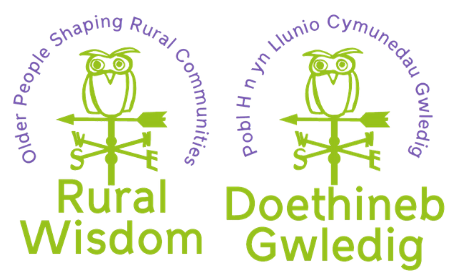 The group have now met four times (as of October 2017) and are going from strength to strength. Between eight and twelve people attend regularly. They are now taking responsibility for organising their own refreshments including lunch for those members who are also attending the gentle exercise class in the morning. The kurling is particularly popular as it is active and competitive while allowing for people of a wide variety of abilities to take part (to push the stone you can use either the pushers (sticks), a ramp or you can release it from hand). 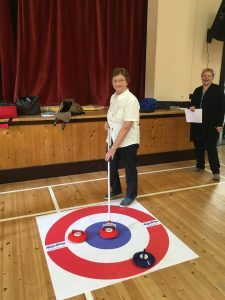 The group have now secured funding to purchase their own Kurling equipment so are progressing towards being sustainable and independent group in the not too distant future – offering a fun, accessible and regular activity for people in a rural area.